However, I do have a few interesting contenders to share. 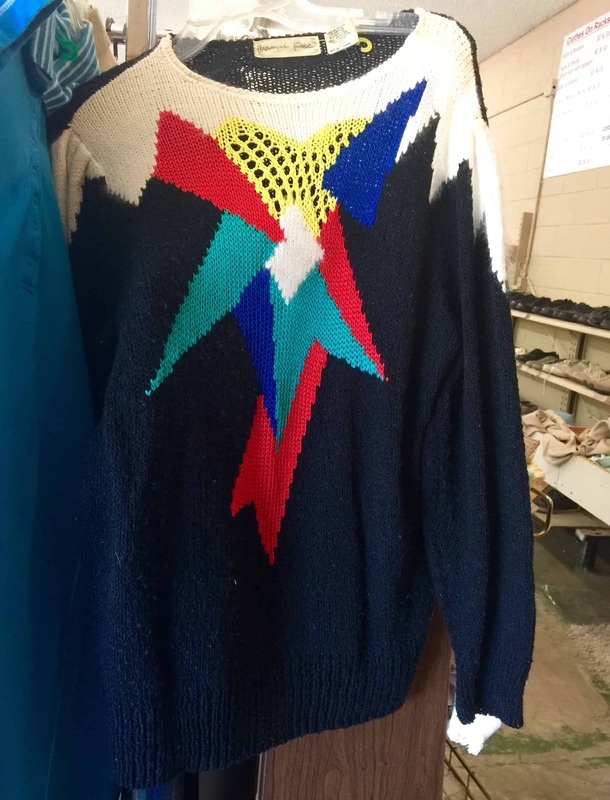 At first glance, this sweater looked really fun and unique. I imagined it wth skinny jeans and boots…until I took a closer look and saw all of those rust stains at the shoulders. I’ve never had much success getting those out, so I left this one behind. Womp. 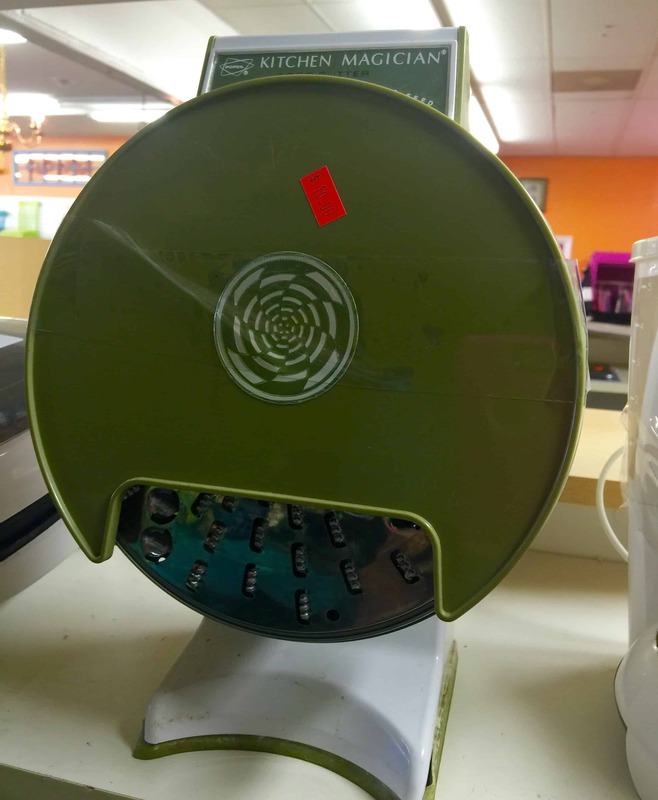 This retro slicer/grater thingy also tempted me. I already have a food processor, so I have no need for this, as cool as it may look. Here the path to hoarding lies, my friends. Womp womp. And I’m SURE if I had purchased these they’d sell for a ton on eBay (And yes…That’s sarcasm)! Womp womp womp. I also passed up on these odd fake wooden books. Must be the condensed versions. Wompitty womp. 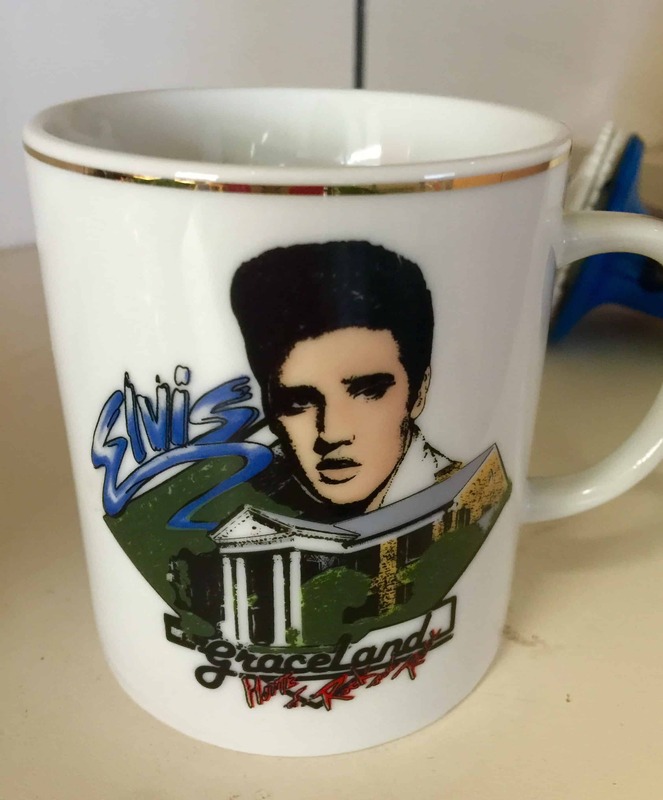 This mug was tempting for the sheer kitsch factor, but I maintained restraint. 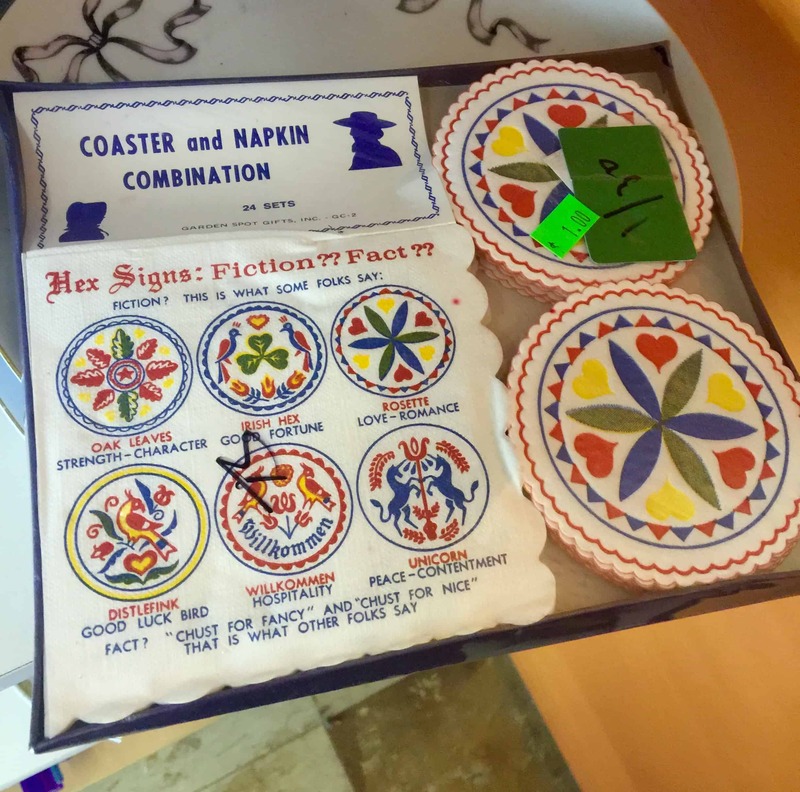 In fact the only item I came close to buying was this mysterious $1 napkin and coaster set. A quick wiki search on Hex Signs revealed that this set is just a cheesy souvenir. Meh. So I have absolutely nothing fun to show you. :/ cross your fingers that my thrift karma will make a triumphant return! In other totally unrelated news, I have bangs now! Does that make this post any more interesting? Probably not, but here they are. The bangs are freaking adorable! It’s still fun to see the womps – I feel like I went shopping with you! Love the bangs! The real art to thrifting is to know when to just walk away. It is a mystery why the thrifting gods throw treasures in our path for weeks and then nada. Last year at this time I couldn’t leave the thrift store without several cashmere sweaters in hand and this year I find zilch. Jillian, I’m headed out to my Goodwill surplus store today. 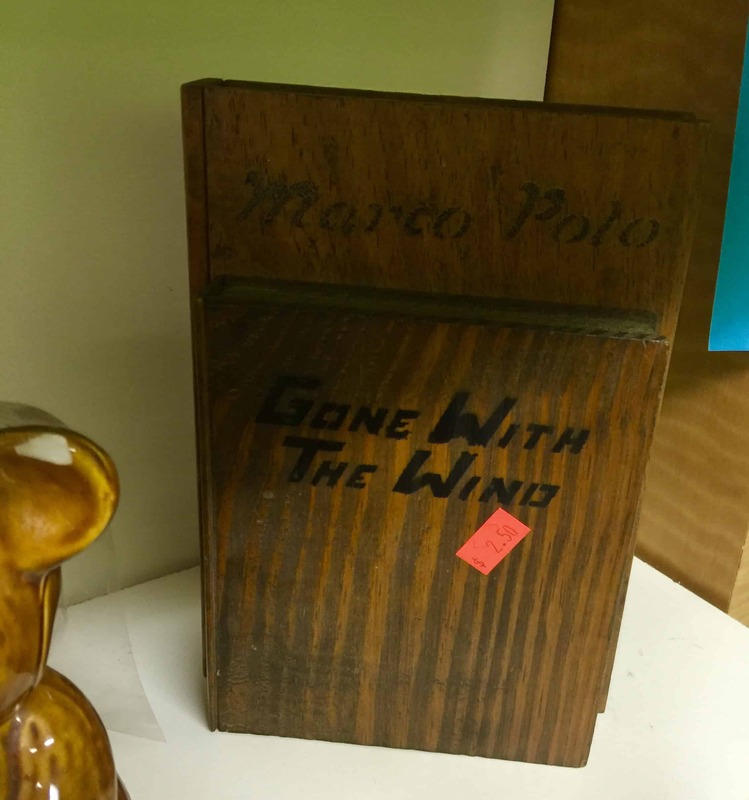 Maybe the thrifting gods are shining on Central Florida….and hopefully I can score for both of us! The bangs look great on you! Looks very nice, the hair! Have you ever used Bar Keepers Friend for rust stains? It is a cleaner for cookware etc. I have always used it to get rust stains out of clothing etc. you find it in the cleaning supplies in the grocery store. Works great, just dampen area make a paste and apply. Of course do a test first to make sure it won’t harm your fabric. Love your posts! You look adorable with bangs! Maybe there is a way to get rid of rust stains. I would really like to know. Yes, those items were not worth any price. Your bangs look good. Enjoy them. Bangs accent your beauty, love the new look! I concur with the others who find the hunt pics just as satisfying as the score. I am busy divesting my own items so while I enjoy looking, I rarely bring anything home and even then my rule is that I must love it. So glad to see your posts each day, I look forward to them. I probably would have bought the Hex signs thingies because I love kitsch like that. I’ve been reading your blog for a couple of months and have just been amazed at the things you’ve made. So after years of not sewing, I decided I’d give this a try and I bought myself a new sewing machine. I decided to go to or local Goodwill to look around and I guess the thrift store gods took the day off because there was absolutely nothing that I was interested in. I did see one dress with some possibilities and started to reach for it when a woman came sprinting across the aisle, yelling “that’s mine” at me, and then she grabbed it up and took it away. I never knew thrifting could be dangerous! btw, the bangs look wonderful. Love the sweater. I use a product to remove rust from clothes, It melts the rust, love it, can be found at walmart, home depot, etc. Has a lot of warnings on bottle but it works. I keep it in launry room. This link shows what the bottle looks like. Thanks, Bev. I tried CLR, which works about as well as vinegar. Whink is the best for rust stains but will take the color out of some things…like your laminate countertops….be careful, speaking from experience!! Lemi-Shine is also really great for overall rust tint and dingy clothing. Just soak overnight, and wash item normally it works great, also great for a dirty dishwasher and removes water spots on dishes too. The bangs look great! Keep up the good work. Good bangs! The pattern on that sweater is just disturbing, sorry… Better luck next time! The bangs are worth the post! Your bangs are awesome! I was looking through some very old posts, and was thinking of telling you to cut you some bangs. Way to read my mind. I appreciate you showing us the items you passed on and why – always learning from you! Glad you didn’t buy anything. Bravo. I love the bangs, they look fantastic on you! Thanks for your blog. Love the bangs! And being from PA, you should have bought the coasters! Au contraire! Your bangs liven up this post quite nicely! Sorry you didn’t find anything this week. Some days are like that, but don’t give up! After losing more than 50 pounds in 2014, my favourite pieces of clothing hung like sacks on me. Your blog gave me the encouragement I needed to start sewing again. This week I remade 3 tops and 2 pairs of pants. Thank you so much for your great blog posts. As for your new bangs… that’s a big yes. Love them. Congratulations! I lost about the same amount in between ’14 and Fall’15. Have had the same problem with clothes I liked, but have not been brave enough to try taking them apart and remaking them to fit. Do you have any advice for a nervous nellie? Sorry you Thrifting Thursday didn’t work out this week, but I enjoyed seeing and reading about the things you didn’t buy. Also really enjoyed the comments from your other readers. I know now what to do about rust stains. L O V E the bangs! 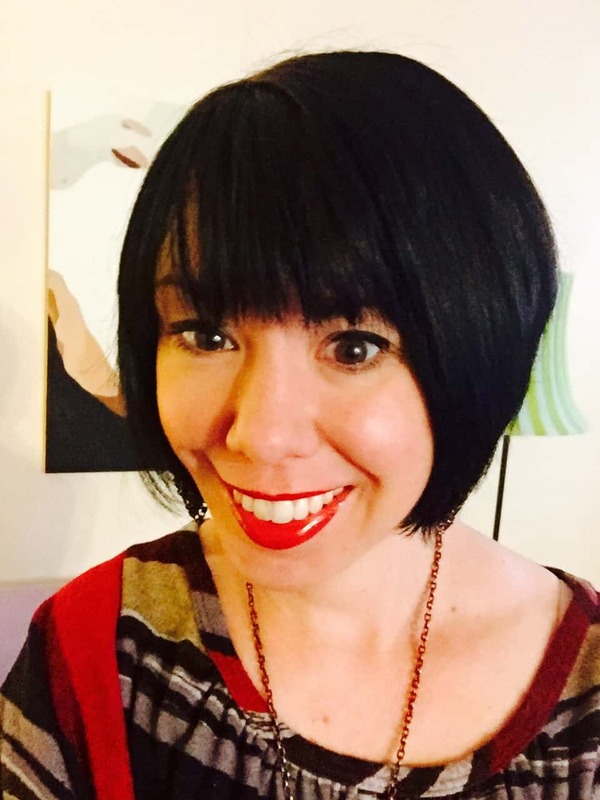 Enjoyed this post… The bangs are great… Sorry the thrift shop Goddess did not hang out with you . I scored big time with small things at Goodwill and Sally Ann today for my current ‘Fidget Quilt’ passion… Came home so pleased I was almost smug…. Nooooooo to the sweater but a big YES to the bangs! So cute! Your bangs look great, Jillian! I have to say I’m for going back for that sweater. Try the rust remover, even maybe paint on bleach on the spots. If all else fails cut out the shoulders and make a racer top dress. Love the bangs. Very chic. Like all your loyal fans, I look forward to your creative, ingenious, information laden, daily posts. Also, like your loyal fans, I say, be kind to yourself. We all appreciate the fact that you have other commitments that demand a goodly portion of your precious time. Your bangs are well suited to your face. Indeed, you really are a cutie pie. Remember, take care of yourself. Your bangs look great on you! I just don’t get that sweater. But can you get any cuter? Oh, yes….with bangs. LOVE the bangs. I have been sporting mine for a couple of years now. I’m fairly new to your blog but LOVE it! You have inspired me to look at my clothes a whole new way, and I’m sure you hear that often from people. What you probably don’t hear as much is that you have inspired me to jump right in and sew! Sewing has always intimidated me! Love the bangs! We thrifting this morning. Bought some fabric, two tee shirts that need taken in and a silk tunic. Thanks for the tip for what to wear when thrifting!! It’s always such a pain waiting for someone to unlock the dressing room or waiting for one to open up. Another vote for how cute the bangs look on you. The sweater, um no. When I read your blog, and the comments, I wish Australian op shops were like those in the US. No way can you find a $1 dress worth refashioning. Most garments start at around $5 and head upwards from there. Therefore, there can be some hesitation at chopping into a $15 – $20 dress, in case it doesn’t work out. You don’t want too many refashioning disasters, at that price. Ho hum. I enjoy the show and tell! Vraiment jolie avec cette frange !!!! Cela adoucit ton visage !!! Et j’adore tellement ton blog, il m’inspire beaucoup !!! Merci à toi, Jillian. I remove rust with lemon juice and salt. It has to be a sunny day. Lay the rusted garment in the sun. Squeeze lemon juice in the rust spots until soaked. Cover the spots with salt and squeeze on some more juice to wet the salt. Leave for an hour. If still there add more salt and juice. This has always worked for me to remove rust from old clothing. I have used iron delicate old fabric with no damage. I use exactly the same method and always had success with it. Thankfully I haven’t had to use it too often though. I love your bangs. You look so cute. I especially liked it for rust in the sink and bathtub. Love the bangs! Thanks for taking us along on your shopping adventures. Hey, my mom had a Kitchen Magician! My job was to dry the dishes, & I tested how sharp the blade was. ..I lopped off half of the top of my thumb. Turns out, it was quite sharp! Whink rust stain remover. Amazing. Ha we all have those ‘dry’ thrifting days – but love the bangs! SC primary. Apparently the thrifting gods were busy rehashing old politicians or younger ones with outdated ideas. THE BANGS ARE DARLING ! ! ! ! !! ! what you didn’t buy and why is just as fun as your thrifty purchases. Sorry your it was a thrifted bust :( Look forward to a thrift score soon! My mother had a set of those napkins and coasters years ago! Too funny. 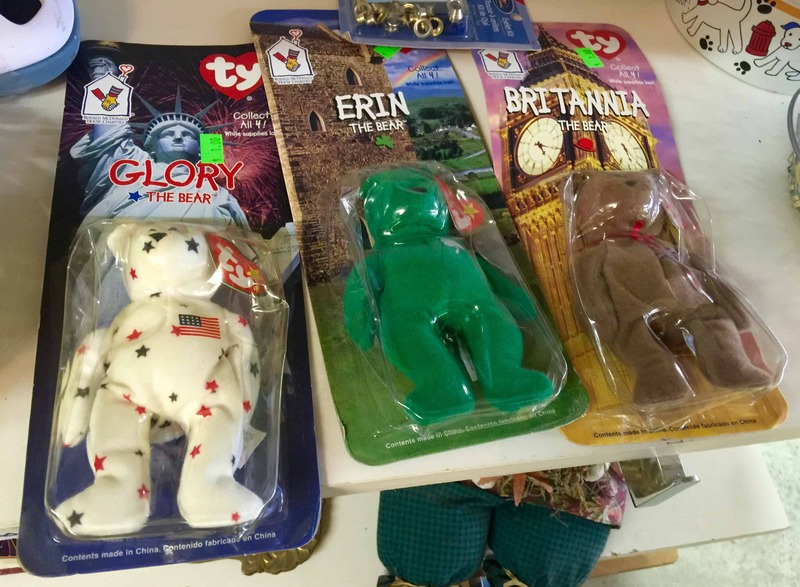 And the beanie baby bears, that made me laugh, I see those in just about every thrift store I go to as well. Better luck next time! Loving the bangs! They look really good on you! Very Chic! I just had a thought for your shoulder pad collection. Pattern weights! Pick the seam open, fill with buckshot or beans and stitch the hole back up. Can be beanbags for kids games too. Love the haircut! The bangs are darling. I love that you shared your lackluster thrift run with us. Sometimes it’s just nice to see it happens to everyone. Your bangs are darling and we love your posts, regardless of actual success. :) Those wood books are super weird, I’m super curious about them now. I’ll forgive you this once though because those bangs are SO darn cute. Love!